One of the factors that determine the success or failure of a package design is whether the package effectively acts as a messenger of the product and brand. A package design not only conveys primary information of a product’s image, but it also offers a comprehensive brand experience that captures a product’s desired values and usage. Therefore, a package design is the embodiment of a product’s core message to its users and the manifestation of the conversation between a user and a product. Let’s take a moment to listen to the story of the product that is illustrated in the Samsung Wearable package design. 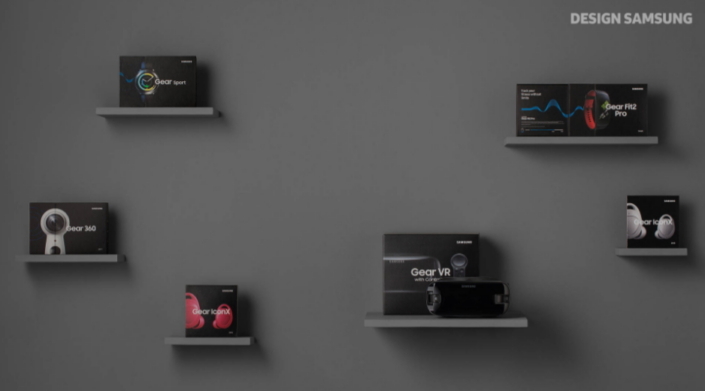 Previous Samsung Wearable packages were great at portraying unique characteristics and strengths of different product categories, but had difficulty conveying the overarching impression of the brand. We analyzed countless competitor products and interviewed package and retail experts to create an all-encompassing brand experience through the package. Through this process, we set our design goal to create a packaging system that exudes the exhaustive aura of a brand and enhances the details of the overall experience that covers the journey from opening the package to holding the product in your hand. Even if you are purchasing a product for yourself, a nicely packaged product that feels like a gift offers a whole new level of precious sentiment. The Samsung Mobile Wearable package acts as its own salesman when displayed on a showcase. The ‘Precious’ concept reflects this idea and provides a modern interpretation of the ‘premium gift’ keyword. From the moment users open the upper box, they are greeted with a ‘Welcome Door’ that creates anticipation for what’s to come. Furthermore, the inbox items, such as the manual and cables, are neatly assembled to express delicate care toward users. The package is designed under the umbrella of the ‘360° Consideration’ concept, which organically connects different aspects of a package that each contain unique information. The design is systemically considerate of users and maintains a fine balance of text and images among all six sides of the box, thereby preventing an overload of information coming from a single element of the package. The compartments of the package flow seamlessly while also being exclusive, which enables the product to become a natural eye-catcher and an impressionable storyteller that tells a tale which goes beyond basic spec details. A package can create a powerful message when all its elements, from materials to color, font, photography, graphics, constitution, and more, form a harmonious and meticulously detailed ensemble. The Samsung Wearable package design augments its consistency with depth in detail to more effectively communicate the product’s language to its users. The product images used for the package were all taken in an honest viewpoint that has the product facing the front. The crisp and clean background that is spread behind the product and the soft light that permeates into the product radiate a confident and modern impression. For products like the Gear Fit2 Pro, which is important to properly show the band color, the images are rotated so that users can properly see the color of the band from the front of the package. Key information such as product and brand names are always placed in the same location of the package for all categories to maintain consistency. Additional information such as the USP, icons, and product descriptions were positioned in order of importance in areas that are easily seen by the user so that all information can be systemically and properly disclosed to the user. The number of colors used in the package is limited to four colors, excluding the colors in the product image. The proportion of how each color is used is carefully determined by its purpose. The Premium Black color that appears universally among Samsung brand products blankets the entire package. The Samsung Accent Blue, used as the Signature Accent, is applied minimally throughout the package just enough to indicate the mood of the brand. White and light-grey are used for typography to immaculately organize product information. Patterns differ from product to product, so each pattern is designed to serve as a metaphor of the product’s specific qualities to evoke sentimental resonance. 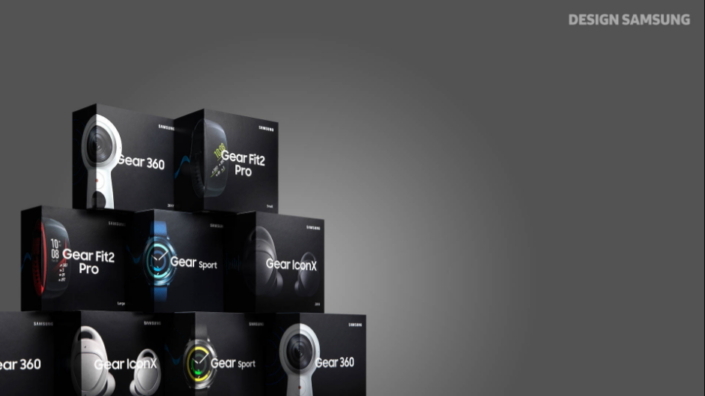 The Gear 360 features a photograph that boasts 360 degree photography, the Gear VR provides a multidimensional view, and the Gear Fit2 Pro shows an image that displays heart rate to exemplify the product. The Samsung Wearable package has been produced in two forms and two sizes, which upholds coherence of the brand when displayed. Even when the volume of the package must be larger to accommodate additional accessories, the z-axis of the package is enlarged instead of the x-axis or the y-axis so that the product is always displayed in a constant size when viewed from the front. Everyone knows the feeling of keeping a package that they were particularly fond of. At times, the package of a product can induce a sensation that is as potent as, if not even stronger, than the sensation that comes from the product itself. The purpose of a package transcended beyond its previous role of simply wrapping up or protecting the product, and has gained its own meaning. 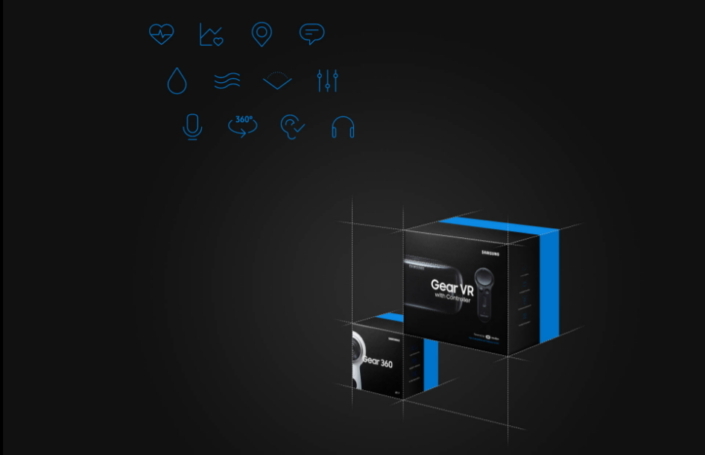 The Samsung Wearable package design has come to redefine the identity and role of the package.